Seeing the Hammer version of Phantom of the Opera again, I have to wonder if anyone seriously thought they could equal, if not better, the 1925 version starring Lon Chaney. I also feel a bit puzzled as to why the story by Gaston Leroux is has been remade so many times. It should be noted that the Chaney version actually was the second filming, the first version being made in Germany in 1916. Of the several versions of Phantom, I have seen four versions, and the ending of one. One version I have avoided is Andrew Lloyd Webber's. Would Hammer's version of Phantom been any better had it starred Cary Grant? Approached by Hammer to be the romantic lead, Grant probably would have distracted from the narrative of the Phantom, and might have been regarded as too old opposite aging ingenue Heather Sears. Far better had Grant enough of a sense of humor to hide his famous face, if not his voice, behind the mask of the Phantom. This version of Phantom involves the phantom seeking revenge for the theft of music he has composed. 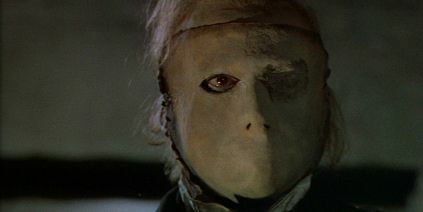 As the Phantom, Herbert Lom is not very scary, and suspense is disappated when he unmasks himself. This Phantom also loses sympathy by slapping Heather Sears around during her singing lessons. The musical thief who takes credit for the opera is played by Michael Gough, who steals the film with his constant smirking, innuendo and indignation when not getting his way. Edwin Astley's music is certainly more listenable than that from Andrew Lloyd Webber. What is not clear from any information I have found is if he had written the actual opera in the film. The music is a bit too modern for the time when the film takes place, and Joan of Arc was not yet made a saint, but I much prefer it to Nelson Eddy in the 1943 version. One bit of opera humor, and a wink towards Hammer's vampire films, involves a singer auditioning with a song from Die Fledermaus. This may not be the definitive Phantom, but how appropriate that a film about opera be filmed at Bray Studios.